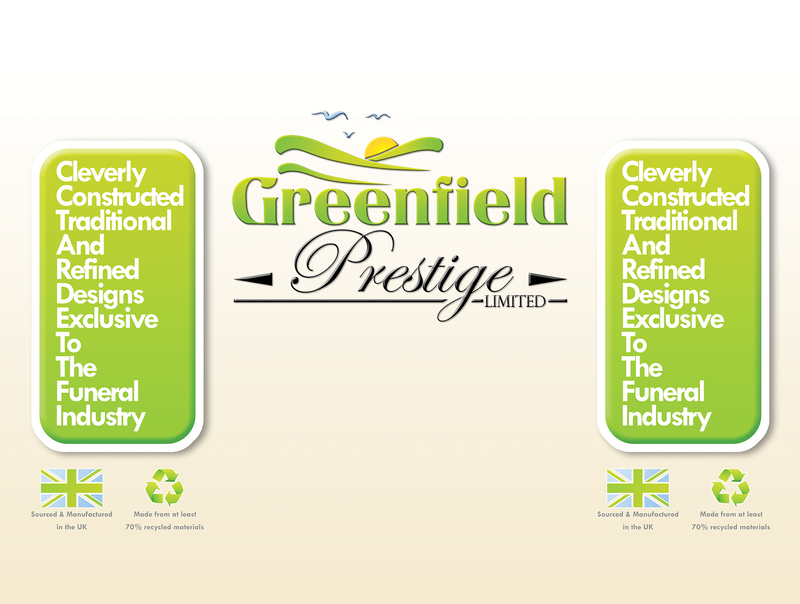 So, as mentioned in the last post, Greenfield Prestige commissioned extensive advertisement and campaign materials after the completion of the companies new logo and branding. 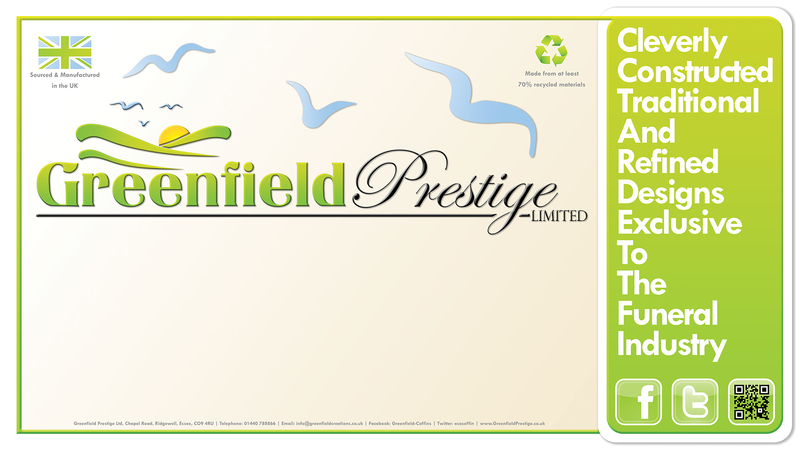 But be for i continue, i think i should explain what Greenfield Prestige actually does. 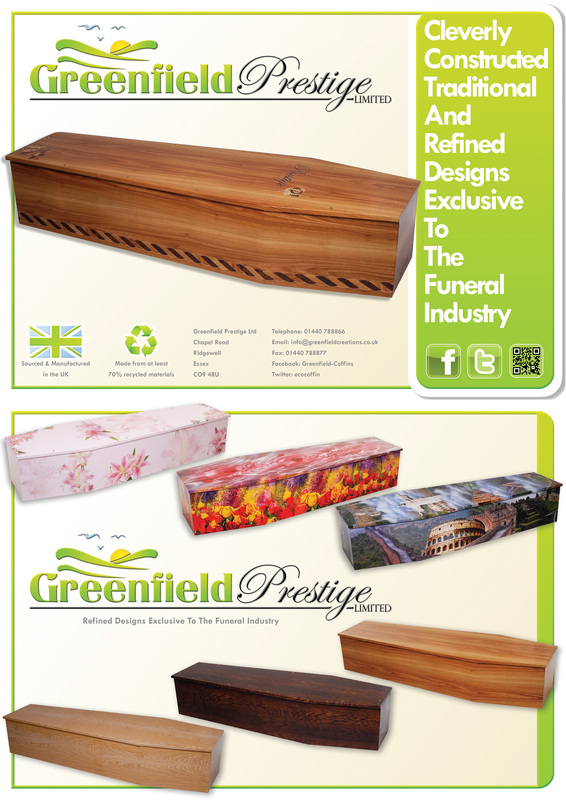 I mentioned in the last post that the parent company (Greenfieldcreations.co.uk) designs and manufactures cardboard coffins, but what i didm’t say was that there new product line is of such a high quality that its pretty difficult to tell the difference between it (a cardboard product) and the real thing. Now, I’m pretty sure i know what your thinking, honestly having visited the factory and seeing the finished article, they are fantastic. The brief for the show and advertisement materials was reasonably simple, using the new logo and colour scheme design materials that portray the new companies existing history (Greenfield Creations) but also create a standalone line that depicts the development and quality of the new product. 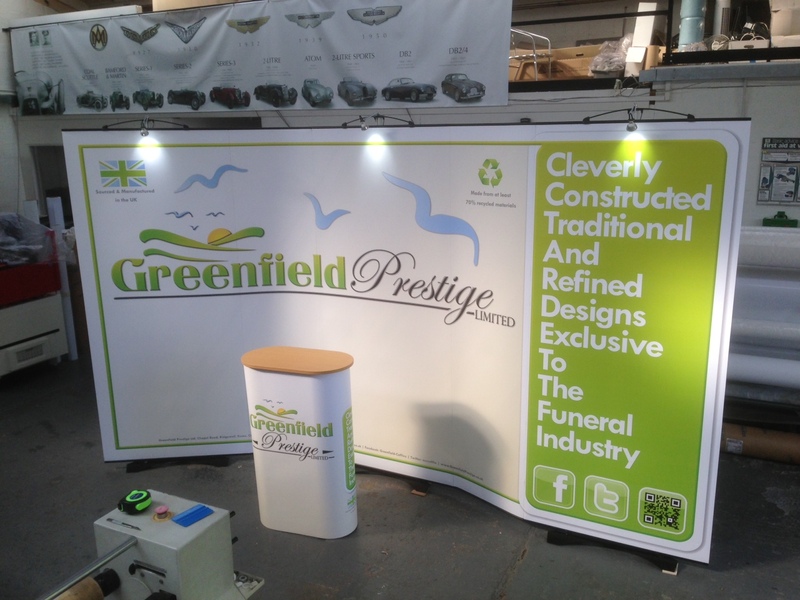 First off on this list was a 4 meter wide by 2.2 meter tall poster stand, along with a podium wrap. This was/is for use at trade shows etc. As you can see the lower half of the banner’s main are has been left pretty much empty. The reasoning behind this should be made clear from the following photos. Next up came an A4 leaflet, these were placed in every bag handed out at the National Funeral Exhibition, that somewhere in the region of 6000 printed just for the show. 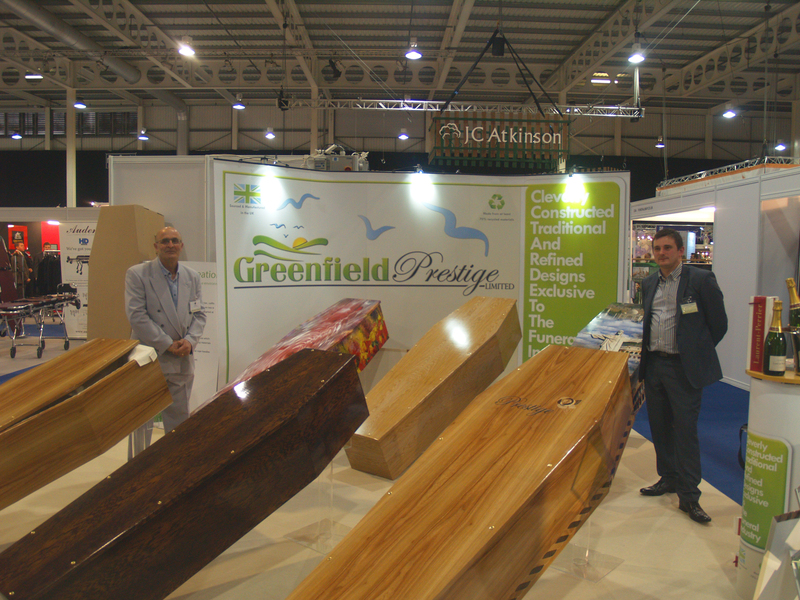 The plane was to spot UV the coffins, giving them an extra shine and helping them stand out even more, but unfortunately time was against the project and this did not get to be realised. instead they were printed on a semi gloss heavy weight paper. As you’ll see below, I’ve uploaded the two options that were put together for the client. One contains on 3D visuals, while the other is made up of photos from a shoot. We went with the photo shoot option. 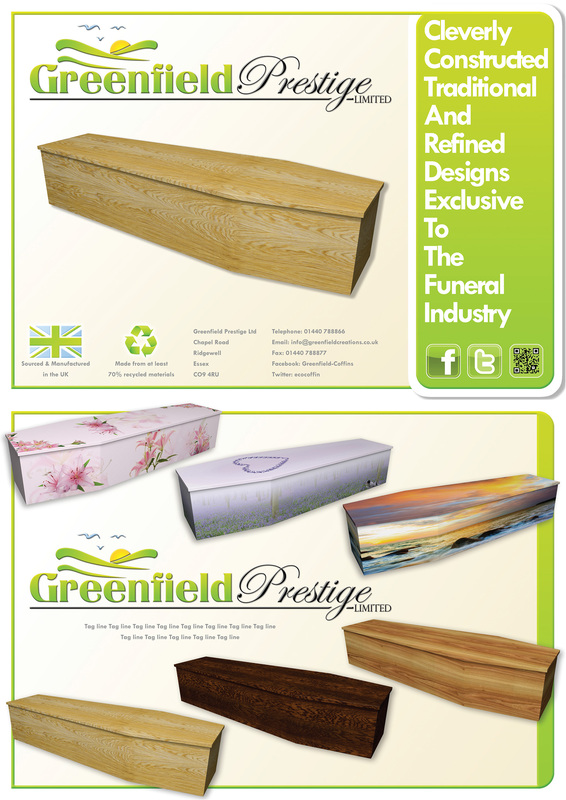 Following the success at the national Funeral Exhibition Greenfield Prestige has been keeping clockworklime pretty busy, with advertising campaigns and other branding related commissions. All of which i will endeavour to post once they have been sent to print. Thanks for reading and don’t forget to keep an eye on the site for new content.